Berkshire Hathaway HomeServices released its latest Homeowner Sentiment Survey, which gauges current homeowners and prospective buyers' outlooks on the U.S. real estate market and economy. According to the survey, homeowners and prospective buyers are feeling especially optimistic about the market and economy. Baby boomers, who are usually the most pessimistic demographic, had a 60 percent favorability rating -- a 5 percentage point hike from the spring. Millennials are feeling better as well. Seventy-six percent of Millennials have a favorable outlook — a whopping 17 percentage point increase from the spring. In January, Berkshire Hathaway HomeServices released its 2015 Q4 Homeowner Sentiment Survey, which painted a somewhat grim picture for 2016. It seems that Phillips prediction was correct, according to the brokerage’s latest Homeowner Sentiment Survey. 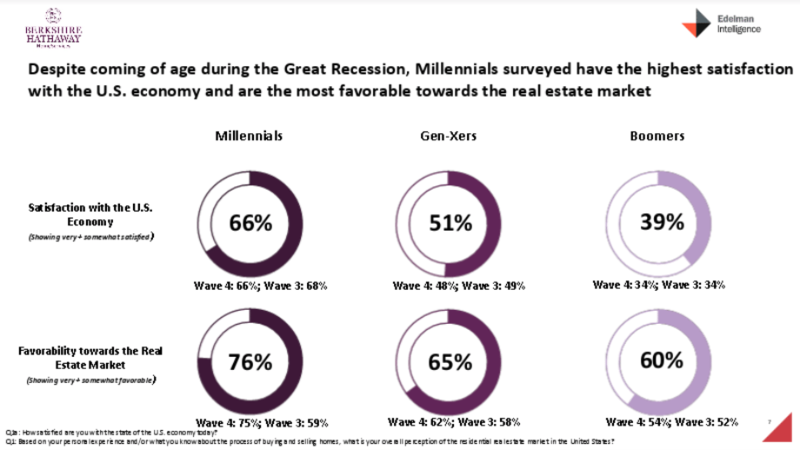 The survey, which was released today, shows that homeowners and prospective buyers of all ages are far more optimistic about the current state of the U.S. real estate market than they were last year due to higher home values, robust housing inventory and low interest rates. Sixty-six percent of existing homeowners view current market conditions favorably, which marks a 5 percentage point jump since spring and the highest levels seen in more than a year. Moreover, baby boomers, who have historically been the most pessimistic group of respondents, experienced a 6 percentage point jump to 60 percent in market favorability since spring. 60 percent of boomers view the economy favorably. 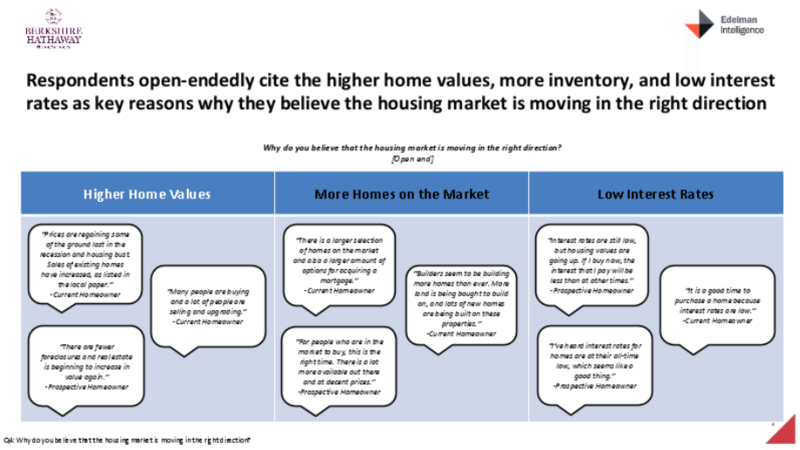 “We find this data particularly interesting in light of the housing-inventory shortage seen in many markets,” said Gino Blefari, CEO of Berkshire Hathaway HomeServices in a press release. Fortunately, baby boomers aren’t the only ones feeling better about the market and economy. Millennials, who were feeling anxious in November, are now the most optimistic demographic. Seventy-six percent of Millennials had favorable views — a 1 percentage point increase from last year, and a 17 percentage point increase from November’s survey. Furthermore, 85 percent of Millennials believed becoming a homeowner is an integral part of achieving the American Dream. Although everyone seems to be much more optimistic, there are still lingering concerns about interest rates. Rates have been at historical lows, and buyers are starting to anticipate a hike in the near future. When looking to the future, homeowners and prospective buyers are keeping a close eye on the presidential election to decide which candidate will be best for the real estate market and economy. 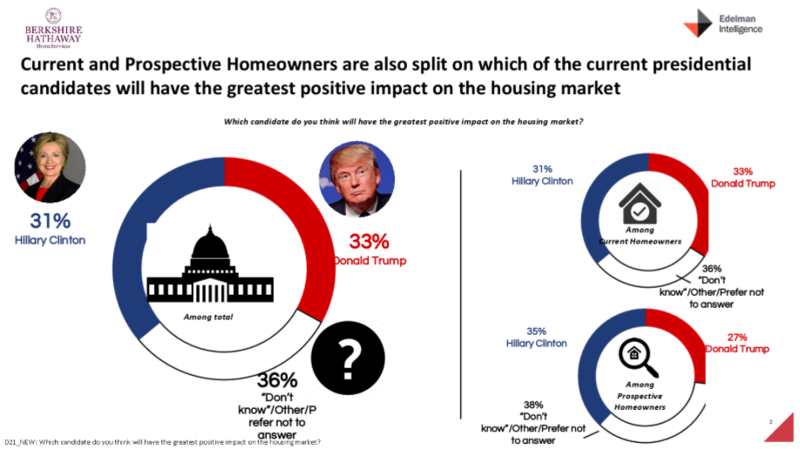 Thirty-three percent of current homeowners think Donald Trump would be better for the market, compared to 31 percent of homeowners choosing Hillary Clinton. Meanwhile, prospective buyers are putting their eggs in Clinton’s basket. Thirty-five percent of these respondents said Clinton would be best for the market and overall economy. But a much larger percentage of homeowners and prospective buyers have yet to make a final decision. “A much larger percentage of survey respondents admitted they ‘don’t know’ which candidate will be best for real estate,” Blefari said.